Home Mender Inc. offers tips and tricks for home improvement that go beyond repairs and maintenance; here you’ll find ways to customize your look, repair and maintain your home, and add style to any room or project. Giving your home a new look doesn’t have take up a lot of time or cost a lot of money. There are a lot of simple, small things you can do to improve your home. At Home Mender Inc. we believe that small improvements make a big difference. 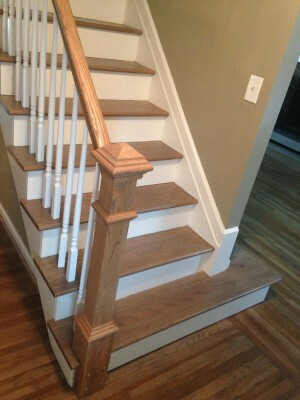 While fixing up various home in Hampton Roads, we realized staircase improvements have been on the list for realtors trying to spruce up a current listing. The fact is, staircases do more than connect levels in your home; their visual presence is an architectural statement. The picture above is of a staircase that we recently improved. We added a new, custom railing made by our very own Dustin Luby. We also stained the hardwood floors and treads and painted the back wall a gray color to add a new dynamic to the space. After looking through the pictures, ideas for different stair projects flooded in. Stairs are a great space to improve not only for style and design but also for practical reasons like storage and opening up space. Here are a few ideas that we came up with. Imagine these on the pictures posted. -Paint a backsplash on the treads; don’t stick with white like the above picture, get crazy and paint different colors, or add patterns, or even words. -For staircases that don’t have an under-the-stairs-cupboard have one installed; it can be designed as a closet or as separate cabinets or even drawers. These are just a few ideas but the point is to get creative! You can do simple things to add a unique touch to your house that will in turn create a home. At Home Mender Inc. we know that improvement is more than just maintenance and repairs, so give your house some love. Home Mender Inc. is here to help, and as always, we want to put a smile on your place!